In this posting I highlight the wines from my recent trip to northern California that stood head and shoulders above everything else. These wines all displayed complexity, structure and concentration, making them standouts. As I reported in the last issue of WVN, there are distinct climate differences between northern Sonoma and Mendocino counties. These differences influence both varieties cultivated and wine style: big reds made with Zinfandel and Cabernet Sauvignon in northern Sonoma and delicate whites and reds made with Chenin Blanc, Riesling, Pinot Grigio, Pinot Noir and others in Mendocino. 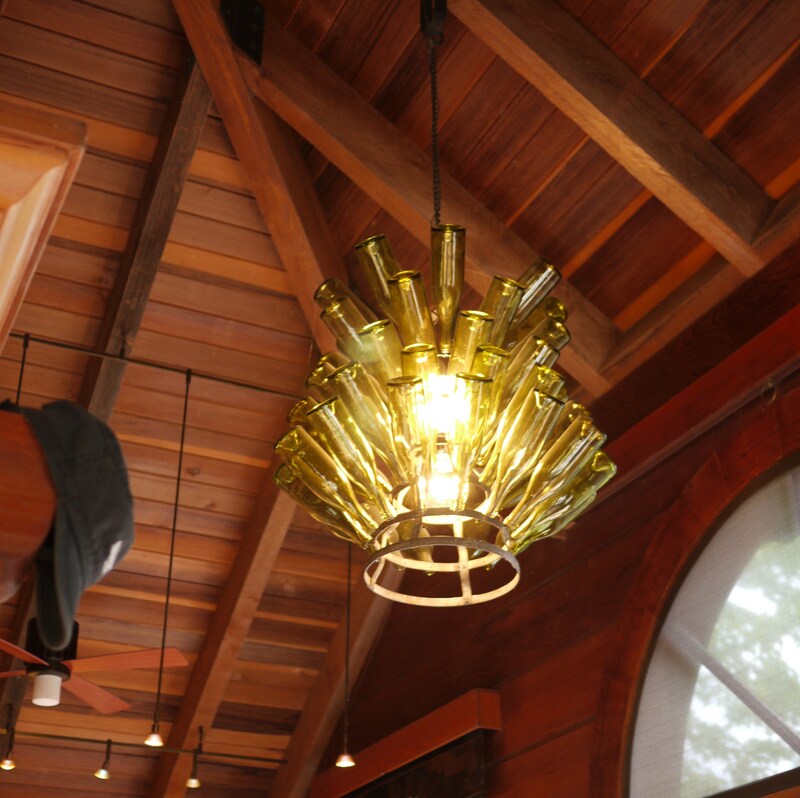 The northern Sonoma area is dense with vineyards and wineries – it is a mecca for weekenders with an immense number of high-quality makers all in very close proximity to each other, a wide array of dining rooms and good-value accommodations. Because the region is farther away from the bay area than Napa, Carneros or the Sonoma Valley regions, crowds are not a distraction from the tasting experience in this part of wine country. Mendocino is very rural and the wineries are fewer in number but the tourist experience is special: there is no crowding in the tasting rooms, the character is more rustic and the hosts are welcoming and knowledgeable. are made for food. The Cabernet Sauvignon has a delicate nose of mint, smoke, leather and black currant preserves. Round ripe fruit on the attack is followed by crisp acid and round, spicy tannins. This is a very food-friendly wine with a long, clean and bright finish. It is refined with an expressive fruit-forward personality despite 20 months in French oak barrels. Put in the cellar: it will age well for at least 10 -12 years. At Ferrari-Carano. I'm the one on the right. This showpiece winery is owned by a successful operator of casinos and hotels in Reno, Don Carano. 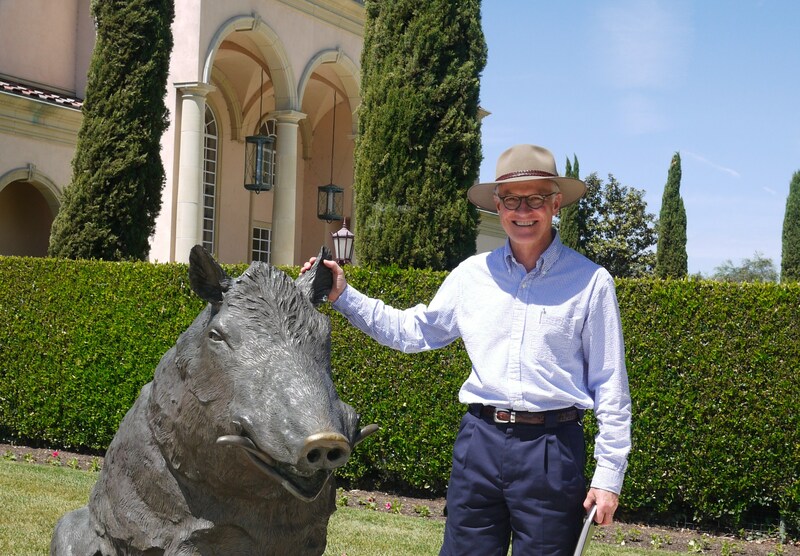 Despite the over-the-top opulence of the estate, the wines made at Ferrari-Carano are very fine: balanced with finesse, expressive fruit and effective use of oak. The Cabernet Sauvignon is a blend with 17% Syrah and 3% Petit Verdot. The nose is elegant with medium intensity showing aromas of cassis, coffee, mint, vanilla and smoke. The palate shows bright acid, grainy tannins and bright black currant and blackberry fruit. There is a spicy backbone throughout the palate and a mouth-coating, fruity finish. This wine is an exceptional value. This is one of three flagship Cabs made by Ed Sbragia, former winemaker at Napa-based Beringer. Ed is known for his use of oak… and then some. Befitting his winemaking pedigree, Ed makes his three big Cabs from fruit sourced at two sites in Napa, the first at Mt. Veeder, the second at Howell Mountain – both very high elevation (1800+ feet) vineyards. The intent is to make the flagship Cabs wines that will improve with time. This wine has a youthful nose even after two years in bottle. It brims with bright red fruit, cassis, smoke and leather. The attack is round and ripe with flavours of cassis, chocolate, bright spice and smoke on the mid-palate. This wine displays exceptional structure with medium-weight green tannins, medium+ acid on a medium-weight body and a well-balanced use of oak. The finish is memorable with zesty and bright fruit and spice. Cellar for the next 15 years. Extra dry, red wine – $75.00 per bottle at the winery (available in Ontario from Treasury Wine Estates – formerly Foster’s). The tasting room at Navarro. Navarro was founded by former Torontonian Jim Bennett in 1973. Navarro has established its name by making Alsatian-style whites from Pinot Gris, Riesling and Gewürztraminer grapes. This place was by far the best tasting room experience I have ever encountered: the staff were amazingly helpful , engaged and informed, the setting was comfortable and the wines were exceptional in every way. Unfortunately, you will have to visit the vineyard to get Navarro wines: they sell 90% of their production directly, in the tasting room or by direct shipment to club members and mail order customers. The Navarro philosophy is very simple – make good wines using sustainable practices and treat staff, customers and neighbours like family. The Sauvignon Blanc is made in an Old World style with subtle understatement in the nose and palate. Herbal elements are accompanied by ripe peach, stony minerals and high acidity. This wine is bright throughout with a long finish. Quite a change from the big, fruity reds of Dry Creek Valley. This is one of a handful of Cellar wines not usually available for tasting. Deep End refers to the deep northern end of the Anderson Valley and is a naming relic from the days of the earliest settlers of the region. The nose is developing with an intense character of ripe berry fruit, forest floor and green beetroot. The palate is very ripe and Old World with assertive ripe berry fruit, grainy tannins, firm body and medium+ acid: the overall effect is an harmonious blend of all the elements. The finish is long and juicy. This is a beautiful, elegant wine that will develop further for another 7 – 10 years…it is a great value! See Navarro visitor reviews here. L’Ermitage is the tête du cuvée for this long-established branch-plant sparkling winery in Anderson Valley, the winery that first put Anderson Valley on the map in the early 1980’s. It spent 5 years in cask before the bottle maturation. A further 3 years in bottle before disgorgement delivers the exceptional character of this grand cru style wine. The nose is bright with aromas of brioche, grapefruit, lime and light smoke. The palate is dry with intense flavours and sharp, aggressive mousse. The acid level is high, providing a juicy mouth feel. Complex flavours of lime, grapefruit, green apple and brioche dominate the palate. The finish is long, crisp and clean. Profound is the only way to describe this big wine. Call this the White House Pinot; it’s been served at gala dinners under three administrations over the past 2 decades. Made from a blend of grapes from the 4 Anderson Valley ranches owned by the Duckhorn group, this wine is made for balance and style. It is the flagship P-N in the Duckhorn family of big Anderson Valley reds but it is surrounded by a group of single-vineyard siblings that aspire to greatness. This is a wine with a developing nose of beetroot, cranberry, red cherry and smoke. Grainy, drying tannins dominate the mid-palate and the mouth feel is distinctly linear and square. The acidity is pronounced and assertive and flavours of cranberry, beetroot, black-pepper and forest floor make this is a classic P-N. The finish is long. This wine is a big one and will age well for the next 7 – 10 years. This was a very satisfying tasting trip and I recommend all readers try to visit this part of California to experience the varied and exceptional wines that are there for the tasting. Where the wineries are represented in Ontario I have indicated the agent and provide a hyperlink to the agent’s home page. In every case you will have to place an order with the agent. It will be rare exception that any of these wines will be available in the consignment warehouse. Enjoy!